Decorating for the holidays usually includes spending hours untangling multiple strands of lights. 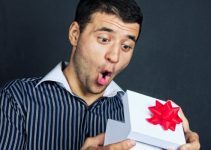 The frustration that ensues can put a damper on your holiday spirit. Fortunately, getting ready for the holiday season has been made much simpler with the use of portable Christmas laser lights. Rather than getting tangled in wire after wire installing strip lights, the Christmas laser light projector variety removes all the hassle and quite often all the danger when installing. With many brands to choose from, it can be a little overwhelming deciding on the best laser light for your home. We put together this list to hopefully help make your decision a little easier. The Christmas laser lights available today offer a variety of features. Before you make your purchase, you may want to consider which of these features are most important to you. Along with lighting colors and patterns, it’s important to decide where your light will be placed. This will also determine the area coverage that will display the lights. For larger homes, a laser light that will cover at least 2,000 square feet is ideal compared to one that will only cover 1500 square feet. Weather resistance and the safety of the laser light is also very important. All of the lights in our list have an IP65 rating for weather resistance and a certificate of approval from the FCC or FDA for safety. Other features to consider are timers for automatic powering on and off and wireless remotes. 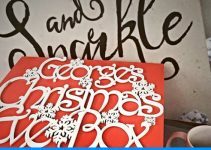 Another great thing about these Christmas laser lights listed is they can be used for other holidays or parties as well. 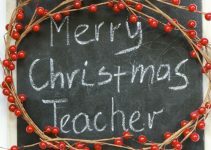 We hope our list helps point you in the right direction for the ideal Christmas laser light. The LaserXplore Christmas laser light provides a beautiful display of over 4000 red and green stars. Placed at a distance of 26.25 feet, it will cover up to 1550 square feet. You can choose one of seven different lighting modes, and it can be set to have the lights move or remain static. A built-in timer powers the light off after 6 hours of use and back on after 18 hours. 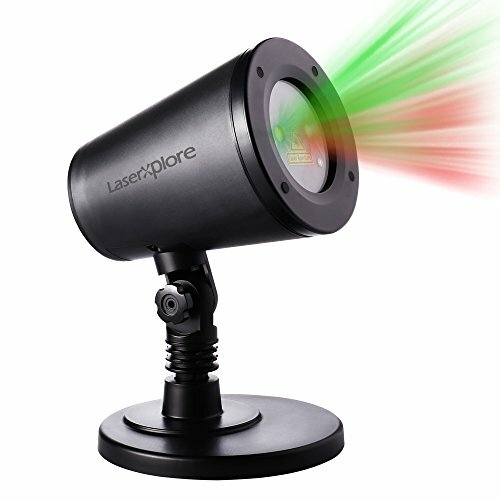 Easily set up, the LaserXplore Christmas laser lights can be installed in minutes. IP65 certified for any kind of weather, it’s also ETL, FCC, and FDA certified for safety. It can be used indoors or out, and the package includes the light, a lawnstake, a deluxe indoor base, one UL listed adapter, and a user guide. 1byone offers a FDA certified class 1113 Christmas laser light for use indoors and out. Red stars and green Christmas trees can be used together or separately to cover an area up to 2100 square feet at a distance of 25 feet. It has a built-in ambient light sensor and timer function making it turn on at dawn and off at dusk. It has ten lighting effects that are controlled by an all-purpose single button. 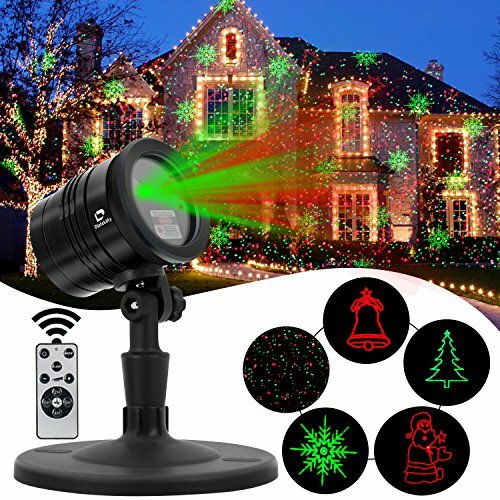 The angle of the Christmas laser light is adjustable, and it is completely weatherproof. This package includes the light unit with screw and bracket, one spike, one stand, and a user manual. 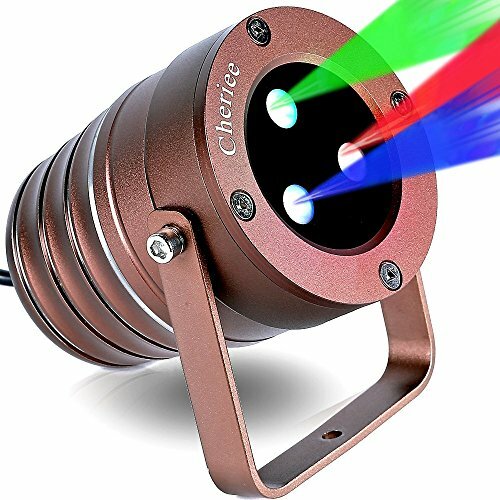 The Cheriee model ARGB aluminum laser spotlight uses laser holographic technology for a beautiful display of red, green, and blue stars. The colors can be used separately or together. 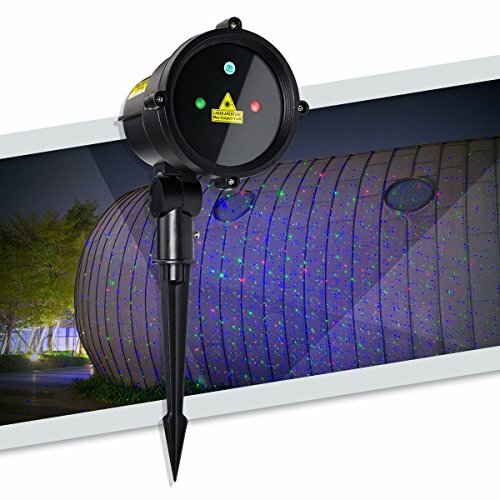 FDA and FCC approved for safety, this Christmas laser light is also IP65 approved for any type of weather. The display covers an area of up to 800 square feet at a distance of 100 yards away. The included remote allows users to control speed, flash, color/pattern selection, and set the timer at 2/4/6/8 hours. Suggested time runs by the manufacturer are 4 hours with 30 minutes of rest during the summer and 6 hours with 30 minutes of rest during the winter. A 12-month warranty is included, and this light has a lifetime of 8000 hours of use. Included with the projector is a ground stake, an RF remote, 2 AAA batteries, an allen key, and a user manual. Tepoinn offers this Christmas laser light with a lifetime warranty. It is IP65 certified for any type of weather. It has 3 lighting modes with red, green, and blue stars. Colors can be used separately or together. The remote controller can be used up to 15 meters away and allows a timer to be set for 2/4/6/8 hours. The display covers a 40 x 40 foot area. 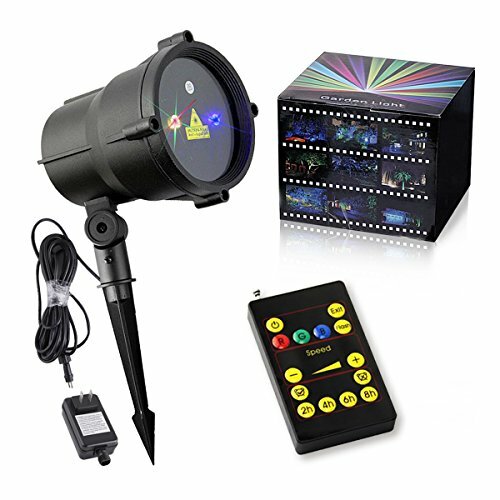 This package includes the Christmas light projector, attachment bracket, remote, 19 foot cable, and a user manual. 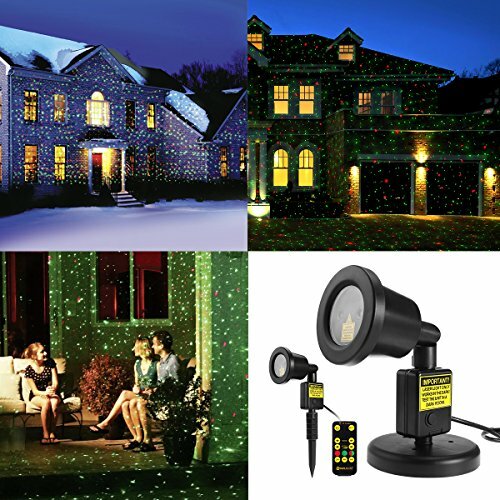 The YBB Christmas laser lights are IP67 certified for any type of weather, and FDA and FCC certified for safety. The aluminum projector casts thousands of warm white stars and has 4 different lighting modes. It is also available in blue butterfly, multi-love, multi-snow, red love, and white stars. It includes a UL adapter. 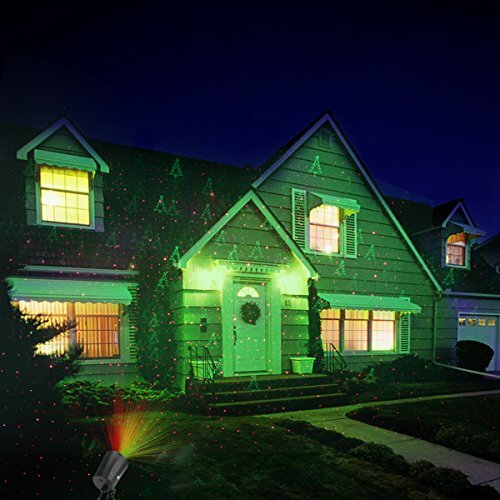 The SROCKER Christmas Laser Light uses class 2 lasers to provide an amazing display of blue and green light dots. The colors can be used separately or together. 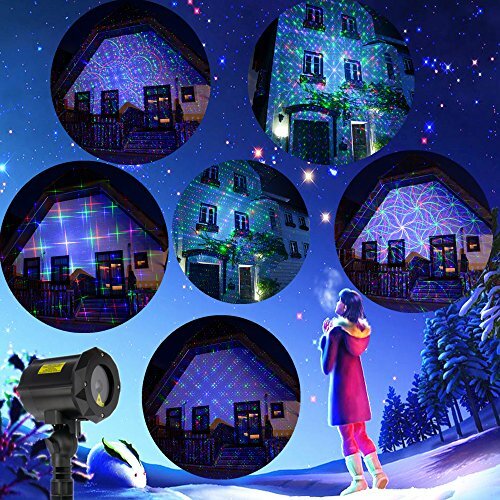 Recommended for outdoor use only, this Christmas light projector is weatherproof and is easily set up. The RF remote controller allows users to select a timer of 2, 4, 6, or 8 hours run time. The remote, one lawn stake, 6-meter cable, and one adapter is included. The MaLivent waterproof LED Christmas light projector is made of silver aluminum alloy and includes a wireless sensor remote. The remote can be used at a distance of 6 meters. It allows users to control flash mode, spinning time, and the timer. 5 different patters using red and green stars can be displayed including Christmas trees, bells, and Santa Claus. The lighting modes include flashing, twinkling, and stationary. The angle of the projector is adjustable. It creates a gorgeous display covering up to 3900 square feet at a distance of 25 feet. The remote can be used at a distance of 40 feet away. It includes a remote, CE & UL certificates, and a 118″ cable. YUNLIGHTS offers this Christmas light projector that creates an amazing display of red and green stars that can be set to static or moving. The lights can be used separately or together. This projector can be used indoors or out and is IP65 certified to withstand any type of weather. Users can control lighting modes, colors, and speed with the included remote. The timer can be set to 2, 4, or 6 hours and automatically shuts off. 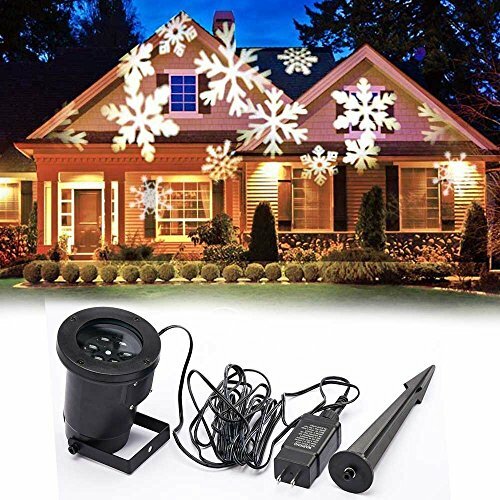 These Christmas laser lights cover an area of 3200 square feet and includes a 30 day money back guarantee and a 90 day warranty. 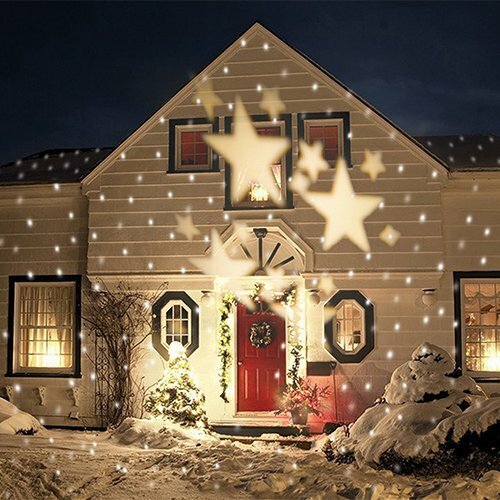 The Diateklity Christmas Laser Lights Projector displays thousands of red and green stars separately or combined to cover a 2150 square foot area. In addition to stars, the Christmas laser projector can also display a variety of Christmas themed shapes, bells, snowflakes, Santa or Christmas trees. The different shapes can be set to flash, rotate, or to remain static. Users can set the timer to 2, 4, 6, or 8 hours and change lighting modes with the included wireless remote from up to 40 feet away. So you could enjoy the outdoor laser light show and change settings remotely without having to brave the cold outside. IP65 certified, this light will withstand any type of weather. It’s simple to set up as it comes with a stand plate or a ground stake. You won’t have to climb any ladders or drill any holes for brackets to fit this Christmas light projector, it couldn’t be simpler. The ShiRui laser light offers 18 patterns in 3 different modes including Christmas, Halloween, and star patterns. Red, green, and blue lights can be used together or separately and will cover a display area of 50 x 50 feet. Three speeds are available including slow, fast, and static allowing users to create their ideal decorative display. It is FDA and CE approved and is IP65 certified for any type of weather. It includes an RF controller that can be used up to 15 feet away. This Christmas light projector can be used indoors or out and includes a security lock. Flash mode and a 24-hour timer are also included. The class 2 lasers can create a magnificent light display of snowflakes, candy canes, circles, stars, cobwebs, ghosts, and more. Included in the package is the projector, adapter, RF remote controller, ground stake, 6 meter cable with extended connectors, a security lock, and a user manual.